What is sustainability and food waste? Sustainability is the study of how systems produce everything it needs for organisms (you and me) and the environment to remain in balance. Sustainability includes three pillars, which includes economic development, social development and environmental protection. The goals of sustainability include ending poverty and hunger, improved standards for education and healthcare, economic growth, and health of the land, air and sea. Food waste is the act of discarding or using food in a non-food that was safe and nutritious for consumption. The Food and Agriculture Organization of the United States estimates that each year one-third of all food produce is wasted. How is Miami University Dining contributing to sustainability and reducing food waste? 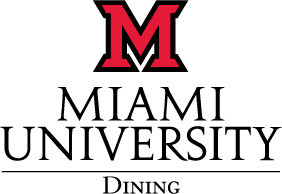 Miami University Dining utilizes recycling to help protect the environment. All trays were removed from buffet dining locations. Since our buffet locations are “all-you-can-eat” you have the ability to go back to buffet lines as many times as you like to get more food. By removing trays from all buffet locations, this encourages students and guests to fill up one plate at a time, instead of filling a whole tray. Dining staff utilizes batch cooking daily during service. This is where staff prep recipes and items prior to service, but do not cook them until they are needed. Once the food is cooked it is policy that it be thrown out after service has ended, regardless of how much is left. If it is not cooked then it can be frozen and saved for later use. By utilizing batch cooking, this allows staff to cook as needed and reduces the amount of produced food items that are thrown out, therefore reducing food waste. How can you contribute to sustainability and reducing food waste in the dining halls? When you are dining at a buffet location try to only fill your plate with the amount you will eat. Start with small portions and if you are hungry after eating your first plate you have the ability to go back for seconds, and so on, until you are full and satisfied. When you are dining at an ala carte location save your leftovers for a later meal, instead of throwing them out. Be intentional with the items you purchase at markets or grocery stores so that you can help reduce food waste. When shopping at markets or grocery stores look at expiration dates on the items you purchase. Think about if you will be able to eat the products before the expiration date. If not, then reconsider why you want that item and what an alternative could be to reduce food waste.